Quick! Name one artist that deserves a book about his last tour – a tour that ended prematurely? 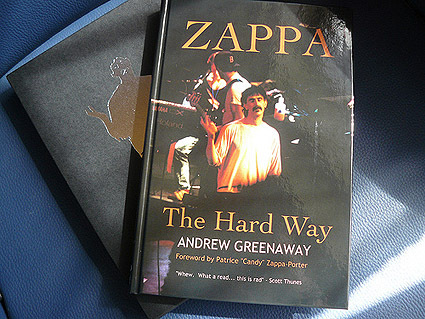 Andrew Greenaway, aka The Idiot, did just that with “Zappa The Hard Way”, a book focused solely on FZ’s ill-fated 1988 tour. I pre-ordered the book almost instantly, naturally because I’m quite fond of the lusciously arranged live music this tour offers, but also in hopes of finding out more as to why it had to end the way it did: was it all Scott Thunes’ doing? Really? Note: my sincerest appreciation and thanks to Andrew Greenaway and MagicFingers for their assistance in the compiling of this mixtape. Mike Keneally sits in with the Rick Musallam Band (a former Beer For Dolphins bandmate) at the Baked Potato on January 6th, 2010. Anyone who knows me, knows I’m a big fan of Mike Keneally. His music is so utterly different from anything else that each and every listening is indeed a delight. When his early recordings (which were long out-of-print) were made available for download, believe me, I scooped them up. The words progressive and eclectic only begin to describe this musical renaissance man.